Saint Anne's Hospital’s diagnostic imaging and radiology services offers a comprehensive range of advanced imaging modalities to help health care providers evaluate and provide information on a variety of illnesses and conditions affecting patients. Saint Anne’s was the first area hospital to adopt PACS (Picture Archiving Communication System) as part of a system effort to link Steward Health Care’s family of hospitals. The PACS system is part of a patient’s secure and confidential electronic medical record providing improved care through integration of various tests and reports, all in one easily retrievable location. provides 3-D views that are valuable for interpretations by radiologists. 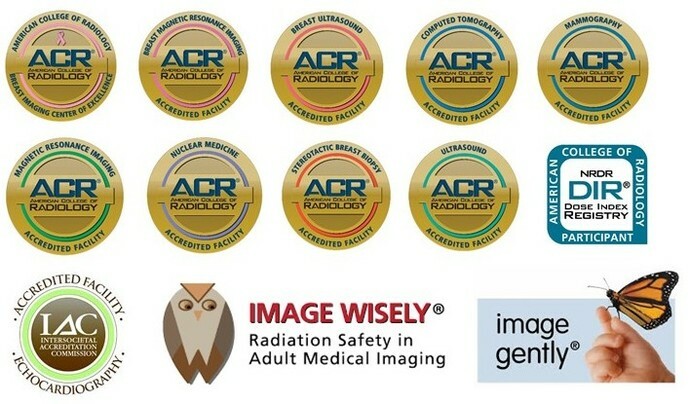 Saint Anne's has earned the American College of Radiology's gold seal of accreditation for CT.
delivers excellent imaging of the soft tissues of the nervous system and herniated intervertebral discs. Saint Anne's has earned the American College of Radiology's gold seal of accreditation for MRI. Echocardiograms. Saint Anne’s has earned accreditation in echocardiography (adult transthoracic) by the Intersocietal Accreditation Commission. Breast MRI is most commonly used to detect breast cancer after mammography, assessing the stage or extent of breast cancer. Breast MRI is part of the continuum of comprehensive breast health services offered by Saint Anne's Robert F. Stoico/FIRSTFED Center for Breast Care. Breast MRI also includes CADstream, a computer-aided detection system used in analyzing MRI studies. Digital mammography is a radiographic procedure that utilizes special equipment to diagnose breast lesions with a low dose of radiation to the patient. PET/CT Imaging allows physicians to view metabolic activity and pinpoint where cancers are located. PET/CT is especially valuable in detecting or assessing certain cancers, heart conditions and neurological problems. Ultrasound uses high frequency sound waves to produce echoes within the body. The strength and timing of the echoes returning to the send point are analyzed by a computer to produce a graphic image of the area of interest. We value feedback about your imaging experience. To help us serve our patients best, please click here to complete our short survey. For care and convenience: Imaging appointments that fit your schedule. Saint Anne's Hospital Imaging Services provides convenient early-morning, evening, and weekend appointments for many services. Click here to see our list of services and choose a time that's right for you.